The city of St. Louis was founded in 1764 by Pierre Laclède and Auguste Chouteau, and named for Louis IX of France. After the Louisiana Purchase, it became a major port on the Mississippi River; in the late 19th century, it became the fourth-largest city in the United States. 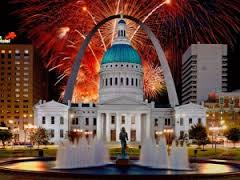 It seceded from St. Louis County in March 1877, allowing it to become an independent city and limiting its political boundaries. As of the 2010 census, the population was 319,294, and a 2012 estimate put the population at 318,172, making it the 58th-largest U.S. city in 2012. The metropolitan St. Louis area, known as Greater St. Louis (CSA), is the 19th-largest metropolitan area in the United States with a population of 2,900,605. St. Louis has four distinct seasons. Spring is the wettest season and produces severe weather ranging from tornadoes to winter storms. Summers are hot and humid with temperatures of 90 °F or higher occur 43 days a year. Fall is mild and sunny, with lower humidity and can produce intermittent bouts of heavy rainfall, with the first snow usually falling in December. Winters can be brisk and stimulating; however, extended periods of very cold temperatures are rare. The city operates more than 100 parks, with amenities that include sports facilities, playgrounds, concert areas, picnic areas, and lakes. Forest Park, located on the western edge of city, is the largest park in the city. Another significant park in the city is the Jefferson National Expansion Memorial, a National Memorial located on the riverfront in downtown St. Louis. The centerpiece of the park is the 630 feet (192 m) tall Gateway Arch, designed by noted architect Eero Saarinen and completed on October 28, 1965. Also part of the historic park is the Old Courthouse, where the first two trials of Dred Scott v. Sandford were held in 1847 and 1850. As of 2014, the St. Louis area is home to nine Fortune 500 companies: Express Scripts, Emerson Electric, Monsanto, Reinsurance Group of America, Centene, Peabody Energy, Ameren, Graybar Electric, and Edward Jones Investments. Other notable corporations from the area include AB InBev, Boeing Defense, Space & Security, MasterCard, Citigroup, Microsoft, Bank of America, TD Ameritrade, BMO Harris Bank, Arch Coal, Cassidy Turley, AT&T Communications, Nestle Purina PetCare, Scottrade, Wells Fargo Advisors (Energizer Holdings, Heritage Home Group, Kerry Group, Patriot Coal, Post Holdings, Inc., United Van Lines and Mayflower Transit, Ralcorp, Hardee's, and Enterprise Holdings (parent company of several car rental companies). Health care and biotechnology institutions with operations in St. Louis include Pfizer, the Donald Danforth Plant Science Center, the Solae Company, Sigma-Aldrich, and Multidata Systems International. St. Louis is also home to three professional sports teams: the St. Louis Cardinals, one of the most successful major league baseball clubs, the hockey St. Louis Blues and the football St. Louis Rams. The city is commonly identified with the Gateway Arch, part of the Jefferson National Expansion Memorial in downtown St. Louis.